Much ink has been spilled of late on the tensions between China and the United States over the South and East China Seas. As Canada begins to assert its own interests in the Asia-Pacific, it may have the opportunity to play the role of intermediary in China-U.S. strategic and military relations. This potential comes in particular from Canada’s long-standing military ties with the U.S. and its own position as a benign and relatively harmless actor. Specifically, its current rapprochement with China, especially in the military and strategic arena, makes this a possibility. If Canada is in fact able to balance Sino-American strategic relations, it will be a major foreign policy victory for Canada, which is currently seeking to assert itself in global affairs. China’s strategic relations with the U.S. are already integrated into one political triangle. Bobo Lo, a research fellow at London-based think tank Chatham House, has described a China-Russia-U.S. triangle in which China is the node that balances out Russia and the United States, especially in terms of their own respective roles on the world stage. While Russia and the United States occasionally use China against one another (the so-called “China card”), China is hardly a pawn; rather it is a strategic actor executing its own interests and political will. In terms of the potential Canada-China-U.S. triangle, Canada seems to be in a position to play this role as well, albeit in a different form. 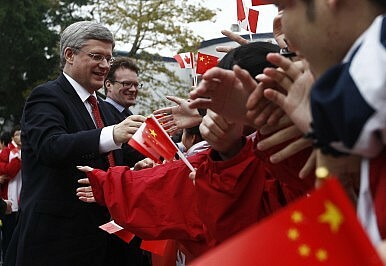 Canadian Prime Minister Stephen Harper has noticeably changed his stance toward China. Previously, the Conservative prime minister maintained a hard line against the PRC based on what he perceived as a poor human rights record. That position has softened over recent years. This seems to be part of a broader strategy aimed at transforming Canada, traditionally Atlanticist in its political leanings, into a leading actor in the Asia-Pacific. Specifically there is ample opportunity for Canada and China to enter into a symbiotic energy relationship. China of course desperately needs energy, and wants a diverse base of suppliers. Canada, in turn, is a major energy producer and exporter and would find a very willing customer in China. Among the Western democracies, Canada has something of a history as a catalyst vis-à-vis the West’s relations with China. Canadian Prime Minister Pierre Trudeau was the first Western leader to open up to China, starting in 1970 when Canada officially recognized the government in Beijing as the legitimate government of the land (and the stage had been set for this by Trudeau’s predecessor, John Diefenbaker). Although Hugh Stevens of TransPacific Connections attributes Canada’s renewed interest in strengthening ties with China in part to following the lead of the U.S. “pivot” toward Asia, Canada has the potential to again be a leader and innovator in its own right. Canada’s own unthreatening position can only help. While Canada’s relationship with China is largely based on trade and investment, military relations between Canada and China continue to develop apace, well beyond the conventional placement of military attachés at each country’s respective embassies in Beijing and Ottawa. In March 2012, then-Canadian Chief of Staff General Walter Natyncyk participated in a high-level visit to China and met with top brass from the People’s Liberation Army. In August 2013, Robert Nicholson, who had become Canada’s Minister of Defence only a month earlier, held talks with his Chinese counterpart Chang Wanquan on deepening Sino-Canadian military cooperation. Canada is bound to the U.S. militarily in several ways: both are members of the North Atlantic Treaty Organization (NATO) and have established, on a bilateral level, the North American Aerospace Defense Command (NORAD). Furthermore, Canada is committed to the defense of the North American continent in case of attack, meaning Canada is bound to intervene in an attack on the U.S. Elinor Sloan of Ottawa-based Carleton University postulates that if China and the U.S. were to engage in conflict, which would likely be maritime in nature, the Royal Canadian Navy would probably be integrated into U.S. naval units, if Canada decided it did indeed wish to participate (or was even obligated to under its own treaty commitments*). The strengthening of military ties between Canada and China may therefore cause certain awkwardness or possibly even strain in Canada’s strong defense relations with the U.S. Yet there is also the potential for Canada to act as a sort of diplomatic balance between Beijing and Washington. This would not be balance in the traditional sense of a balance of powers, but rather in the form of Canada’s ability to ease tensions between China and the U.S., and possibly even help build trust between the two Pacific powers. Canada has actually played a similar role between the U.S. and France on several occasions, leveraging its language and cultural ties to France. Canada has used its position to ease Asia-Pacific tensions in the past, for instance during the South China Sea Dialogues in the mid-1990s. James Manicom of the Centre for International Governance Innovation argues that the Track II-style of Canadian involvement in the 1990s may no longer be appropriate or effective given the rise in regional tensions. Nevertheless, as Canada’s military engagement with China increases, this still leaves the possibility of Canada playing a role in soothing regional tensions on an official level. Ottawa has positive relations with the other states with territorial interests and disputes in the South China Sea. For instance, 49 percent of Indonesians say they have a positive view of Canada (and only 16 percent express a negative view). In line with its progressive stance toward China in the 1970s, Canada also recognized Vietnam diplomatically toward the end of the U.S.-led Vietnam War (whereas the U.S. only normalized relations with that country late in the administration of President Bill Clinton). Thus, Canada may be in a position to assist not only as a third node in a Canada-China-U.S. strategic triangle, but also to use its own diplomatic clout hand-in-hand with its growing military ties to China to work between China, the U.S. and U.S. partners in the region, many of whom have called for American assistance in counterbalancing China. While China’s military capabilities and prowess have been overblown and exaggerated to an extent in the American media, it is never too late for the U.S. to assert its strategic interests in the region while at the same time developing smooth and peaceable relations with China. If Canada is indeed able to help bring this about, it would be a three-way win. China and the United States will enjoy a healthy strategic relationship, and Canada will be able to ensure its own interests in East Asia, as well as live up to its policy of boosting its presence on the world stage. Anthony V. Rinna is a U.S.-based foreign affairs analyst and independent scholar.